*Please note specifications and product photos are subject to change. The KK 120 is the ideal solution for compacting polystyrene material. This machine compacts the material in blocks of 120 X 120 mm, which gives a density of nearly 300 kg/m3. Ideal for the retail trade and smaller industrial companies. Used packaging and packaging materials made from EPS in the retail and industrial sectors take up masses of space and require frequent collection. EPS cannot be compacted in ordinary waste compactors. The KK 120 solves both the space and waste problem. It is equipped with an easy readable amp meter, which makes it easy to adjust the compaction force. The matrix and the press chamber are made from stainless steel to extend the durability. 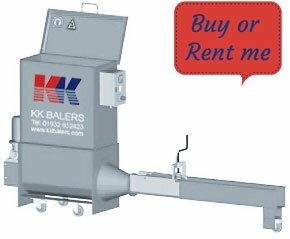 The KK 120 is an ideal solution for various sectors, such as Fish companies, Fruit packers, Supermarkets, Furniture Companies to name a few. For an example of how the machine works for one of our customers, please look at our testimonial from Property Letting Furniture Solutions – Property Letting Furniture Solutions Testimonial. Reduce cost for warehouse, transport and disposal – generate an income from sales of compacted blocks. Low cost for use and maintenance. Takes up very little space – can be placed under pallet rack. Wheels for KK 120 screw compactor with bag holder. Soundproofing in hopper and lid (reduces noise by 10-15 dB). Bag holder, to compact directly into bags. Bags for KK 120 – 500 meters.